The Department of Transportation stated this month that railroads must act urgently to meet a Dec. 31, 2018 deadline to adopt automatic braking technology. Transportation Secretary Elaine Chao made the statement in a letter she sent to 47 of the nation’s railroads in early January. Chao’s urgent call to action came a few weeks after an Amtrak train derailed Dec. 18 near Seattle, killing three people. The train was going 80 MPH in a 30 MPH zone. Federal investigators are still studying what caused the train derailment. But rail experts say that Positive Train Control or PTC could have automatically slowed the train if the technology had been in operation. The system was installed on the train and tracks, but was not functioning when the crash occurred. That deadly Washington state accident and other fatal train crashes in recent years have increased the urgency for PTC, which can slow or stop a train that is not obeying speed limits or track signals. The Dec. 27 letter stated that the Federal Railroad Administration has been ordered to work with railroad leadership across the country to create more urgency to getting PTC installed by the end of 2018. Chao stated that getting PTC implemented on schedule is one of the most important rail safety initiatives on the DOT agenda. Congress mandated railroads adopt PTC after a train crash in 2008 between a commuter and freight train in Chatsworth, California. That crash killed 25 people. Chao stated that after reviewing data about PTC progress, many railroads had fallen far behind schedule and would need assistance from the federal government to meet the deadline. DOT stated that 45% of freight railroad track and 24% of passenger railroad track have PTC working. But 12 railroads stated they have less than 50% of the equipment needed by Sept. 30. PTC provides signals between trains, tracks and dispatch centers to slow down trains that are speeding or to stop them at the appropriate signals if the engineer is not responding. The system requires PTC equipment to be installed on tracks and in train engines. Railroads have installed a lot of the technology over the last several years but too many railroads have fallen behind schedule. The federal government is concerned more serious train crashes will occur with loss of life, so they are pushing railroad companies to get everything done by the end of 2018. 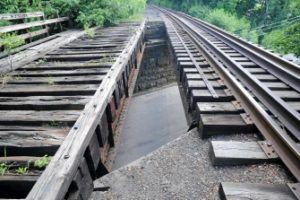 Our Virginia railroad accident attorneys, who have represented train crash victims in personal injury lawsuits. support the federal government pushing railroad companies to get PTC installed as soon as possible. This advanced braking system on freight and passenger trains will save lives. Train derailments cause serious injury and death far too often, and any safety system that can prevent these accidents is worth doing.